If you live in Lime Rock or Wood River Junction, both in Rhode Island, a new study says you might be living between a rock and a hard place. Towns with “Fort,” “Junction” or “Rock” in their names bear the lowest home values in the nation, tallying average prices under $116,000, while towns with “Island,” “Beach” and “Harbor” boast values in excess of $440,000, according to a new study from Porch, the Seattle-based home services platform. “Whether it makes sense or not, the names and identifiers of our American communities and housing developments often say more about the people living there than we might realize,” according to the study released Tuesday. Even a portion of a community or housing development’s name can say a lot about its residents, according to the study. 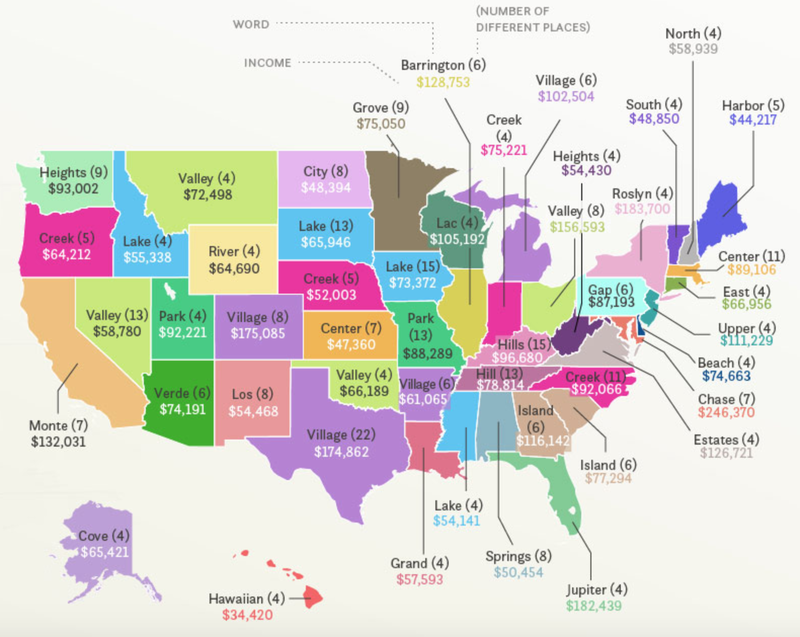 Across the country, towns with some version of the words “Fort,” “Junction” or “Rock” in their names are worth, on average, less than $116,000 while household incomes in those areas range between $45,000 and $60,000, according to the study. By contrast, towns boasting “Island,” “Beach,” “Harbor,” and “Hills” in their names fetch $440,386. In May, the National Association of Realtors estimated that the average price of a single-family home reached $264,800 nationwide. “Words associated with ocean destinations and seaside escapes, like ‘Island,’ ‘Beach’ and ‘Harbor’ had the highest home property values anywhere in America,” according to the study, with affluent neighborhoods such as Beverly Hills and Miami’s Fisher Island coming to mind. Similar types of names can be found in some of the wealthiest neighborhoods in the nation. Towns with the word “Hills” boast an average household income of $89,976 while the word “Island” earns its residents an average of $87,527 per family. And so if you are a first-time homebuyer looking for a simple space, towns with the words “Acres,” “Oak,” “Lakes” and “Green” in the name may be your best bet — these towns boast lower home values but still have bustling job markets and higher incomes. Towns with the word “Los” and “Springs” in the name struggle with the lowest incomes in the country — $29,757 and $41,066, respectively. 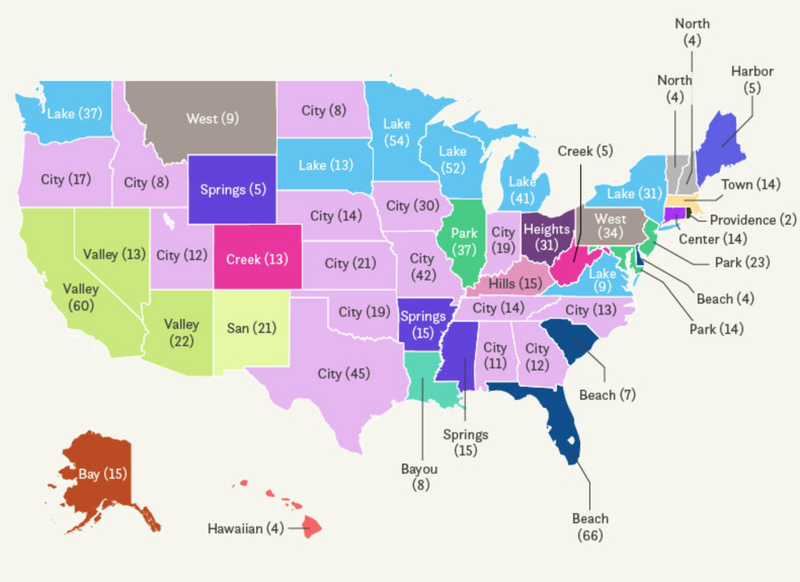 But as much as the name of a place can point to its housing market, some names are simply common — “Lake,” “City” and “Park” came up as the most common town names across the United States, according to the analysis. Article image credited to Photo Credit Kngkyle72/iStock.com.